My Honey Honey top is finished! I trucked through and finished the rows and borders in one sitting. It was pretty quick, except for all the pinning! I'm a little particular about my corners - remember these? This baby finishes out at 71x86, and the solids are Kona white and candy green. The prints, of course, are Honey Honey by Kate Spain. Love what the green border brings to the party. So lovely. I never order backing before the top is finished. I feel like I dont really know the quilt until I see the top done and it is just one less decision I have to make early in the game! I know - total weirdo! This top looks awesome! 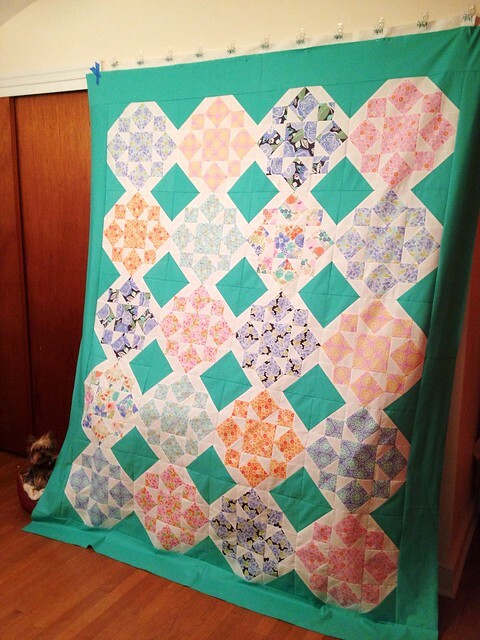 The quilting will really pop it! Your quilt is really pretty. Love the colors and pattern. I absolutely love your quilt! Is it the Whim one from a thimble blossoms? If so I just bought that the other day - thought I might give it a go with some muddy modern fabrics like Center City. Bt then I love your version so much too! Thanks for sharing it with us! Love your Honey Honey top! This fabric line is so beautiful and I think your layout really compliments the colors - great job spacing them out! I can't wait to see how you quilt this!